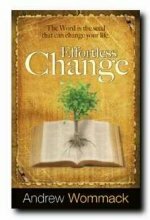 Description: Effortless Change - it sounds impossible. Yet, that's what the Word reveals about how the kingdom of God works. Most people view change as a difficult, painful, and labor-intensive process. To their way of thinking, it takes a huge amount of effort to change their thoughts, actions, and circumstances. Due to this, change is something they resist. It's hard to change routines, traditions, and long-standing problems. People get stuck in ruts - ways of thinking and doing things. Therefore, there's just a natural resistance to change. In this book, Andrew Wommack will share some truths with you from the Word of God that can totally transform the way you understand and approach change. If you receive these truths into your heart and apply them to your life, you'll be able to see change take place in your life effortlessly.